Whoever said, “You can’t take it with you” didn’t own a 2017 Cherokee Arctic Wolf lightweight fifth wheel trailer. This new coach from Forest River is a game changer in the fifth wheel industry because despite its luxury looks, it’s both highly affordable and transportable! 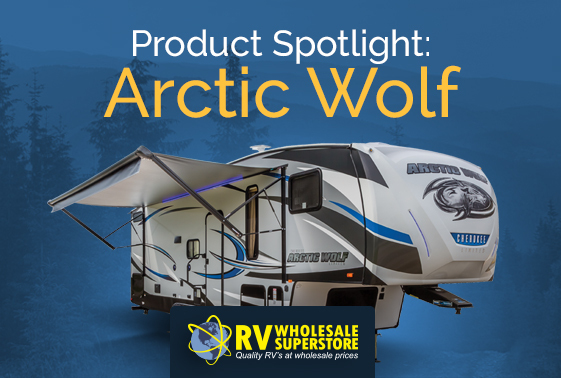 The 2017 Arctic Wolf is the first laminated Cherokee fifth-wheel, but its beauty (and it is a beauty) is more than skin deep. It’s a full-featured, lightweight coach that can be pulled by almost any truck on the market. Plus, it offers upgraded insulation and a host of other popular options as standard equipment. And all this comes at a low entry-level price! Let’s take a closer look at just a few of the reasons why the Arctic Wolf will be an industry best seller. It’s easy to hitch, easy to tow, and easy to level. The lightweight design of the Arctic Wolf keeps its towing weight around 8,000 lbs., which is great news for campers who don’t want to invest in a heavy-duty pickup to pull their coach. Not only that, this model comes with a Reese Revolution hitch, which is ideal for half-ton and short-bed pickups. The hitch allows for a smooth ride and easy backing into even the tightest spaces. It allows you to move your pivot point back 22”, so you’ll never be in danger of hitting your cab – even when you make 90-plus-degree turns! Another bonus – its compact footprint takes up less room in your truck bed many other fifth wheel hitches, so you’ll have room leftover for your gear. Once you’ve reached your campsite, you won’t have to fuss with leveling the coach. The Arctic Wolf has an easy-to-use, automatic 4-point leveling system as standard equipment, so you can start relaxing as soon as you’ve parked your rig. There’s plenty of built-in space, comfort and luxury. Unless you play for the NBA, you won’t worry about bumping your head inside the Arctic Wolf.This coach was designed with plenty of headroom; even the slide-outs have 6’7” of clearance!Cherokee didn’t skimp on room in the bathroom, either, which is oversized and easily accommodates almost every camper and all their personal amenities. Longing for a good night’s sleep when you camp? You’ll find it in the Arctic Wolf, which features a Comfort-rest posture-conscious bed system. The system lets you to automatically adjust your sleeping or sitting angle, maximizing the space in the bedroom while allowing for a comfortable angle for reading, watching television, or sleeping. Then there’s the kitchen – the heart of this phenomenal fifth wheel. With seamless countertops, an under-mounted sink, and an under-mounted stove, the kitchen in the Arctic Wolf will make it feel like you never left home. There’s a residential-sized refrigerator standard in this coach, which includes a 1,000-watt inverter, so you can power it with your battery. One thing you’ll find in the Arctic Wolf kitchen that you probably won’t find in your home kitchen – the ambient soft blue lighting, which provides a soft, relaxing glow that adds to the comfortable camping experience. Finally, there’s storage. In fact, there’s storage everywhere in the Arctic Wolf. There’s plenty of storage in the usual places and even storage in some unexpected places, such as in the steps and behind the television. Whether or not you can ever have enough storage in your camper is up for debate, but the Arctic Wolf maximizes every available inch. With all this going for it, you’d expect the price of the Arctic Wolf to top out with the other luxury fifth wheel coaches on the market today. Not so. Despite its size and the standard amenities, the Arctic Wolf comes to market under $30,000 – well under the entry-level price of its competitors! So if you’re looking for a fantastic, lightweight fifth wheel with a host of luxury features at a truly affordable price, look no further than the 2017 Cherokee Arctic Wolf!